Considering I have quite a collection of healing clays in my pantry, it seemed an obvious choice for experimentation. 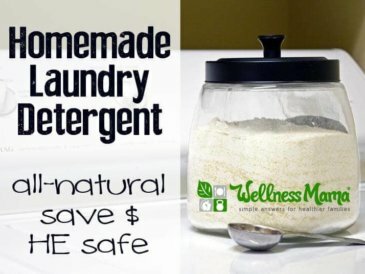 So instead of using it simply as a natural colorant, I began adding it for it’s other beneficial properties. Adding Clay to Homemade Soap? 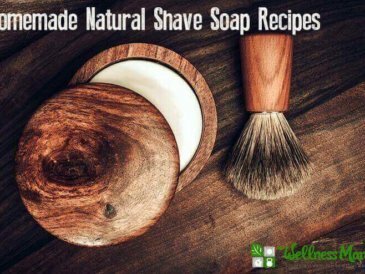 I began by adding clay to my homemade shaving soap. The addition of the clay provides the “slip” that is needed for a smooth shave. 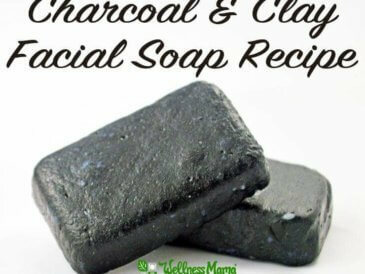 Another favorite of mine is charcoal and clay facial soap. What started as an experimental body soap became one of my favorite facial soaps. Then I decided that I wanted to have the silky experience my husband had so I added some clay to my own favorite body bar. The result was a lovely soap that had a good lather and also makes my skin feel soft. As an added bonus, it works well for shaving my legs and is also gentle on my face. Healing clays are a staple for a healthy lifestyle. I use clay to wash my hair, as a relaxing way to detox my bath water, and I have even taken it internally to help reduce morning sickness. There are several different healing clays that are wonderful in soap. Rhassoul clay is found in the Atlas Mountains of Morocco. It has a silky texture and is nourishing to the skin. It also has a high negative charge which enables it to draw blackheads and impurities from the skin. Because it is high in minerals such as silica, magnesium, and potassium, it is wonderful for hair, skin, and nails. Rhassoul clay changes the color of your soap to beige. Bentonite clay is another great clay that can be added to soap. It also has an amazing capacity to absorb toxins from the body making it great for oily and acne-prone skin. It is composed of volcanic ash and is a light gray color but will add an almost greenish tint to your soap. French Green clay, as it’s name suggests, is a green color and it will also turn your soap very pale green. The clay gets it’s color from a combination of iron oxide and decomposed plant matter. It has a long history of being used to treat a variety of skin problems and is especially effective on oily skin. French Green clay may be too drying for already dry skin. Kaolin clay, also called white cosmetic clay, is very mild and good for use on all skin types. It is gently exfoliating and adds the “slip” to soap that helps to make a nice shaving soap. Rose clay is a pink colored kaolin clay and offers the same benefits as white Kaolin clay. It is often chosen for it’s pink color to naturally color soap. If you are new to soap making, you will want to familiarize yourself with the process. 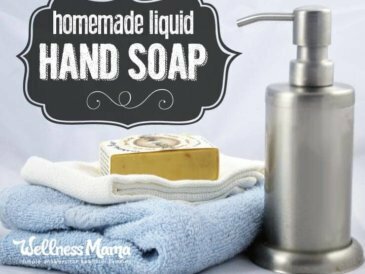 It is not difficult to make your own soap, but there are some important things you need to understand that will make the whole adventure easier and safer for you. 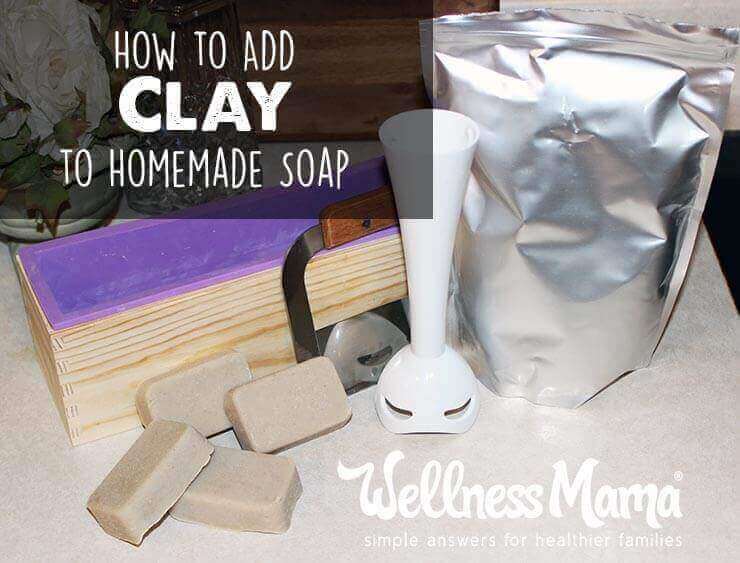 Clay is very easy to work with and is generally added to a soap recipe at the rate of 2 teaspoons per pound of soaping oils (total weight of oils). The following recipe has 32 oz of oils so I used 4 teaspoons of clay. 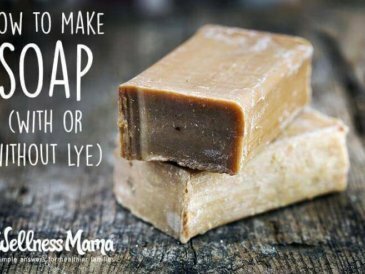 The easiest way to add clay to your soap is by mixing it into the warm oils before you add in your lye/water. Once the oils are fully melted, just add the clay and mix with a stick blender until the clay is incorporated. This method evenly disperses the clay throughout the entire batch. If you are using the clay to color only part of the batch or to create a swirl you will have to add in a few extra steps. Follow the soap making instructions below. When you add the lye/water, stir JUST until combined evenly with oils. Spoon or pour out the amount you want to color into a separate bowl and add the appropriate amount of clay to one or both bowls. The tricky part now is to get both bowls of soap to trace at the same time. Work quickly because if one gets too thick it will be difficult to get the right look when you do your swirl. Once they are both ready, you can continue with your preferred method of swirling or layering. 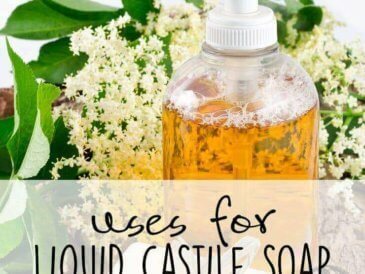 This recipe has a 5% superfat and makes 3 lbs of soap. All measurements are by weight. Put on your protective gear, place the glass jar on the scale and tare your scale. Pour distilled water into the jar until it reads 10.5 oz. Set aside. Put the second jar on the scale and tare the scale. Carefully pour lye into the jar until your scale reads 4.5 oz. In a well-ventilated area or outside, slowly pour the lye into the water. Stir the mixture until the lye is dissolved. It will become quite hot so be careful if you need to move it. Let this mixture sit and cool to around 100 degrees. While the lye is cooling, measure all other ingredients EXCEPT the essential oils and warm them together in your pot or slow-cooker. Once they are melted, remove the oils from the heat and add the clay. Use your stick blender to mix the clay in until it is completely dispersed. Let oils cool to around 100 degrees. I use the infrared thermometer about every 5-10 minutes to test the temperature. This works really well but a candy thermometer placed in each container also works. Ideally, you want the lye/water and the oils to both be around 100 degrees and within 10 degrees of each other. If one is cooling faster than the other you can put your oils back on the heat source or the lye/water mixture in a warm water bath to slow the cooling process a bit. When the temps match, slowly pour the lye/water into the oils. BEFORE you turn your stick blender on, make sure the blade is completely submerged or you will splash it everywhere. Use the stick blender to bring the batter to a light trace. It should be slightly thick and resemble cake batter. Put the mold somewhere it can sit undisturbed for 24 hours. Let sit for 24 hours. You can now remove your soap and cut it. I cut the bars about 1 inch thick which gives you 1o bars weighing approximately 4.8 oz each, but you can cut them whatever size you like. Have you ever used clay soap? Will you try to make it?